Ohoho! I’ve been waiting for this! The squeal to Transformers: War of Cybertron has finally been announced! It is called Fall of Cybertron. I really liked WoC, sure it had its problems but its my favorite Transformers game. And I’m certain FoC will be better and hopefully a bit longer. 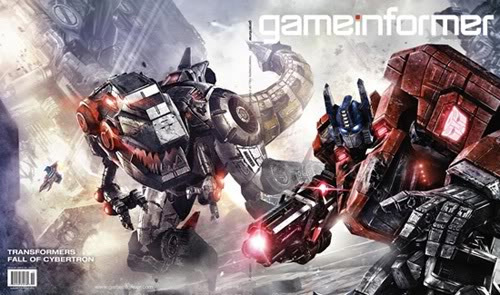 Grimlock has been confirmed to appear in the game, in his T-rex form no less. That’s awesome! And I’ll guess you’ll love that wont you ZX-Omega? But you are not the only one. The Combaticons are also in the game and will combine to form Bruticus. Glad we are seeing some combiners in this game and for once it isn’t Devastator. Based on some artwork from a video (can’t find it right now) Megatron has been given a little redesign. Wheeljack and Swindle seem to be joining th fight too. I’m eagerly anticipating this game. Jag behöver spela det första spelet, damn vad jag behöver spela det. Det är rätt kul första, lite enformigt. Och ska vara lite i Gears of War stil. Enligt dem som jämfört, men jag gillar det. Trots de brister spelet har. Men detta nya spelet kan bli så grym!